← 26. Audio QR Codes. Making Paper Talk! These 3 tools are diamonds in a sea of instructional technology tools. Draftback is a MUST HAVE Google Chrome extension. I absolutely love using it. It has tremendous value for English Language Arts teachers. Draftback allows users to play the entire revision history of any Google Doc, even documents which were created before you installed this extension. After you install the extension, you just click the Draftback button, and a video will be generating showing the actual document being typed up. With this extension you get to take peak into your students writing process. Just make sure you are using the Google Chrome browser. You can use this link to install the Draftback Google Chrome extension and click on ADD TO GOOGLE CHROME. 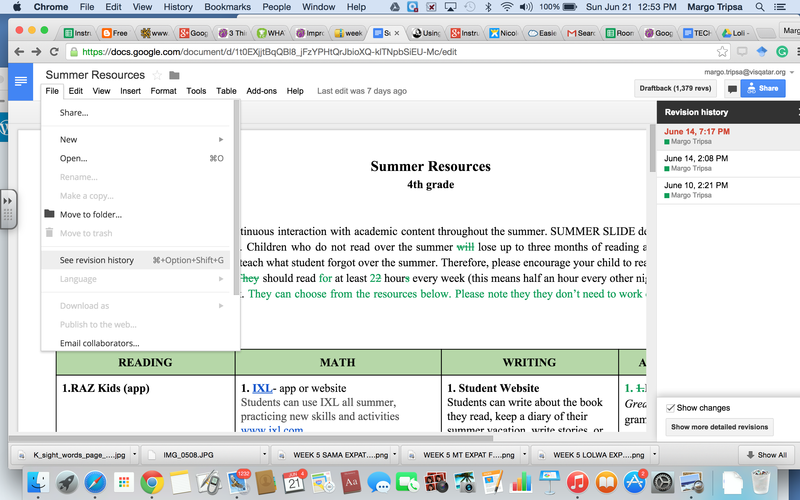 In the classroom, I use it in conjunction with the feature offered by Google docs (go to FILE —SEE REVISION HISTORY). While this feature shows you different static versions of the document and the changes made to it, Draftback plays a quick video of the editing process. You can adjust the speed as you like. By going to FILE, and selecting SEE REVISION HISTORY, you can see who made what changes to the document, and also what time those changes were made. You can always select SEE MORE DETAILED REVISIONS (see this feature on the bottom right corner). Note that the screenshot below shows the Google doc feature “See Revision History”. This screenshot is followed by 2 short videos (1 minute each) which show Draftback in action. Once, you did it once, the next time you just click on the draftback tab and play the video to see the whole editing process. Such a valuable tool! 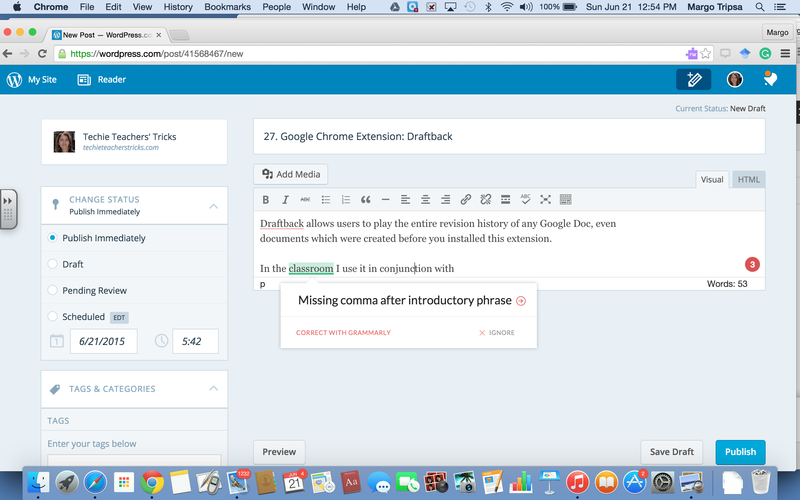 Grammarly is another great Google Extension. It does a great job catching even small typos or grammar mistakes. See below a picture of my screen while editing this blog post and how it pointed out to me the need for a comma after “In the classroom”. I think this is pretty cool! I tested Grammarly by copy-pasting different content I created for academic purposes and I was quite impressed with the job it did. I can only say I wish I had this extension when I was in grad school. What a great writing tutor! It provides a variety of features some of them for a fee including help to detect plagiarism. It is DEFINITELY worth a try! It even gives editing suggestions when you write emails (gmail). In honor of Teacher Appreciation Day, Read and Write for Google (Google Chrome extension) is free for educators. This extension is absolutely AMAZING. It provides comprehensive reading and writing support for Google docs, Web content, PDFs, and Pubs. It provides features such as: read aloud, dictionary, translator, picture dictionary, fact finder, highlighting tools, vocabulary lists. Users can use different colors for highlighting, and then they can collect those highlights by color, create lists and print them out. What a great way for students to create vocabulary lists! When using the picture dictionary the students can print out pictures along with those definitions. The second article below details its functionality. It is a great tool for English Language Learners, exceptional students, or simply all students or GAFE (Google Apps for Education) schools. First, if you are a teacher and have a Google account (gmail), download the extension, and then, to get all the premium features that would require you to purchase them otherwise, go to rw.texthelp.com/drive/home/RegisterTeacher and register by filling out the Teacher Registration form (it will ask you to type in your name, school administrator name, and other details to confirm eligibility). My suggestion is: Do this while this is still free for you, don’t wait too long. I wish students could use it for free, as well. It would be so great! Time for a well deserved summer break now! Enjoy it! To get my future posts via email (one post a month), you can subscribe by entering your email address in the box found on the right side of this screen. I hope the info I am sharing with you through my blog will help your students at least as much as it has helped mine. This entry was posted in 21st century skills, Educational Technology, iPad, Second Language Learners, Video Tutorials and tagged Draftback, editing, GAFE, Google Chrome extensions, Google docs, grammar, grammarly, Read and Write for Google, writing process. Bookmark the permalink.